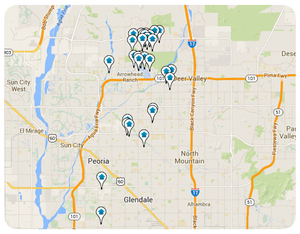 Starlight Estates is a Peoria neighborhood situated on the Southeast corner of Pinnacle Peak & 91st ave. This rather small subdivision offers affordable and affluent homes within a nice quaint community of neighbors. Located near some of the fine conveniences Peoria has to offer, you need not drive more than just a couple minutes in any direction to find what it is you are looking for, be it shopping or fun.